Each traveler holds a distinct motive when visiting Raja Ampat Regency. One of the most common objectives is to enjoy the serene nature! In this case, Saleo Beach could be a great choice for them. This serene and stunning beach is located in South Waigeo District and belongs to Waisai City, actually. It can be said it is a recommended tourist destination for those visiting Waigeo Island. With a peaceful nuance and flawless beauty, the beach keeps attracting more tourists as the time goes by. So, what can people do there? Most tourists come to Saleo Beach for relaxation and sightseeing. No wonder, Saleo offers a romantic nuance in the afternoon. The sun shines beautifully at dusk, mesmerizing any visitors who come to such location. When it comes to the best spot to enjoy the sunset, it is near to the beach. That location is covered by lush and tall trees, creating a comfortable nuance for relaxation. The calm sound of the waves would soothe visitors, as well. Moreover, some parts of the beach are shallow, featuring crystal clear water. The best thing to do in Saleo Beach is witnessing sea scenery and the sunset. This explains why most people come there in the afternoon when the sky is red and the sun starts setting. These people carry a camera and start taking pictures of such charming moment! Does it mean tourists won’t visit the beach on other occasions? Well, the morning view is also worthy. In fact, it provides more soothing atmosphere and the water is cooler either. That means it is suitable for eradicating stresses, so tourists can go back to their home burden free. With a peaceful nuance, Saleo Beach would satisfy any visitors, especially those living in Waisay City. It is because the location is quite near to such settlement. Not to mention it also attracts tourists from other provinces, which usually comes in holidays. Even the local government has conducted several efforts to introduce the island to more tourists. On top of that, it is also included in a tour package in Waigeo Island. No wonder, people who visit Waisai also drop by in such beautiful coast. There is no fee to enter the beach. Still, tourists should carry some money, as they are likely to buy some snacks offered by local vendors. 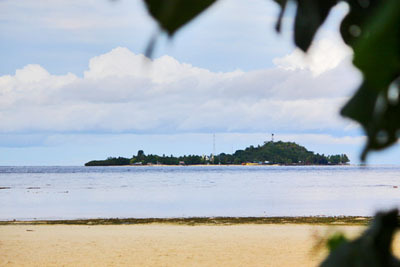 People living near to Saleo Beach also provide traditional accommodations to visitors, after all. That means everyone can spend more than one day there, enjoying a peaceful and soothing atmosphere of the environment. At night, they can even throw a BBQ party with their family or friends. What a wonderful experience! For those coming from Jakarta, take an airplane to Waisai City (Marinda Airport). Saleo Beach is located near to it, after all. It takes about 30 minutes from the downtown, especially using a good transportation service. Hiring a tour guide is optional, but it would be useful for outsiders. Despite the fee, his service is worthy.